Dental Bridge | Eastern Long Island, NY | Joseph F. Sciotto D.M.D. Well you can! 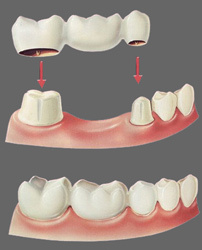 At Joseph F. Sciotto D.M.D., we may have the perfect solution for you in a fixed dental bridge. Give us a call and we’ll be happy to schedule an appointment for you so the doctor can take a look at that space and recommend treatment options.